October | 2014 | Every good thing…. Friday we received a letter from the FCC. In it our call sign and MMSI code for our AIS and VHF radio. What a pleasant surprise, and now we are official, Lori Bell is in the worldwide data base. Ok, I started this post on my iPhone. 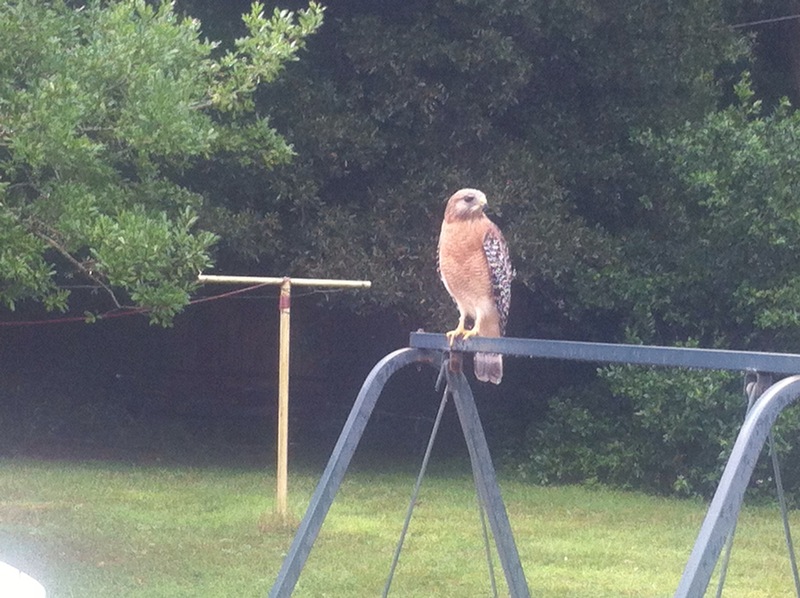 It takes much more effort to peck in a post on that thing. I tend to be less verbose and not flush out my thoughts as much when typing on it. First off let me say I really enjoy WordPress as a service. 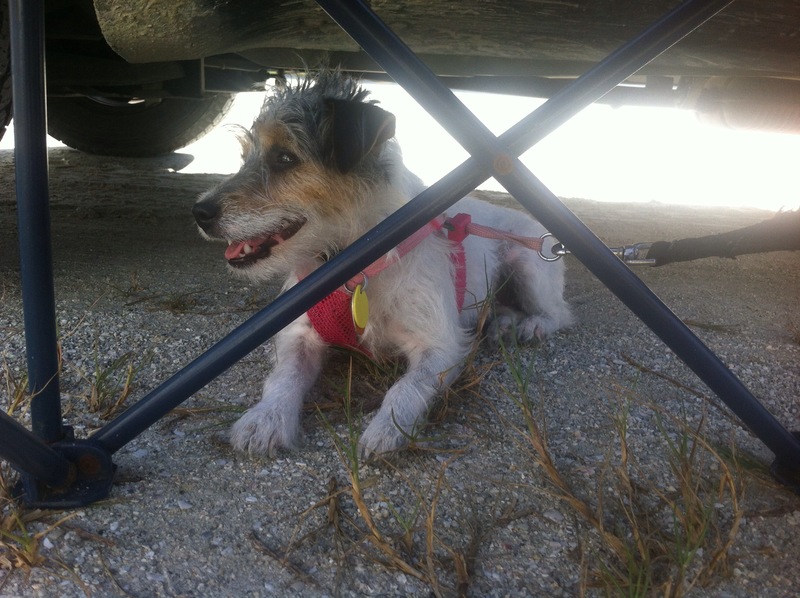 I use their reader to follow a number of other sailing blogs and enjoy them immensely. 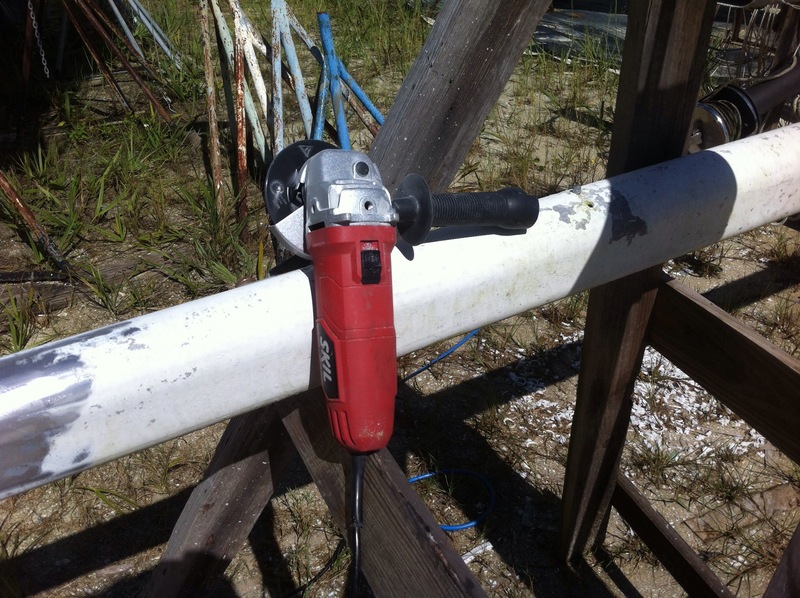 These are just so well done, as our blog tends to dwell on the grind of boat repair these blogs give us inspiration of what is ahead when we finish. Automatic Identification System- basically our boat will ping so other boat so equipped can see us on their plotters/radar. Here is an what it looks like on a plotter, Port Canaveral. If you are lucky you can catch a cruise ship coming and going. Anyhow, a little over a week ago we applied at the FCC for a MMSI and call sign for Lori Bell. By Saturday when we got back from the boat there was a letter in the mailbox with our assignments. Wow, what super turn around, good job FCC. FCC letter, blocks for back haul, boom end for goose neck, piston rings. This photo encompasses the major themes of the work on the Bell. Finishing the electronic, FCC letter. Rigging the mast and boom, out haul blocks and goose neck. Engine Rebuild, piston rings. Mast work continues apace. The Alodine finish seems to be holding up nicely and is unchanged after two weeks. New spreader and brackets on the mast. 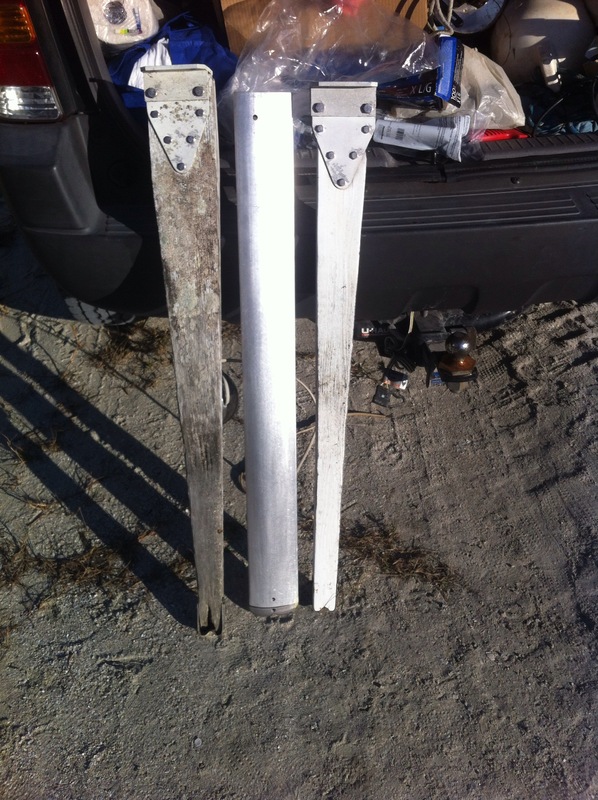 Here is a photo of the old spreaders, their poor condition one of our prime motivations on restoring the mast. Why are the two old spreaders of differing lengths you ask? Well good question, surely this was some new type of asymmetrical rig? My guess, no. 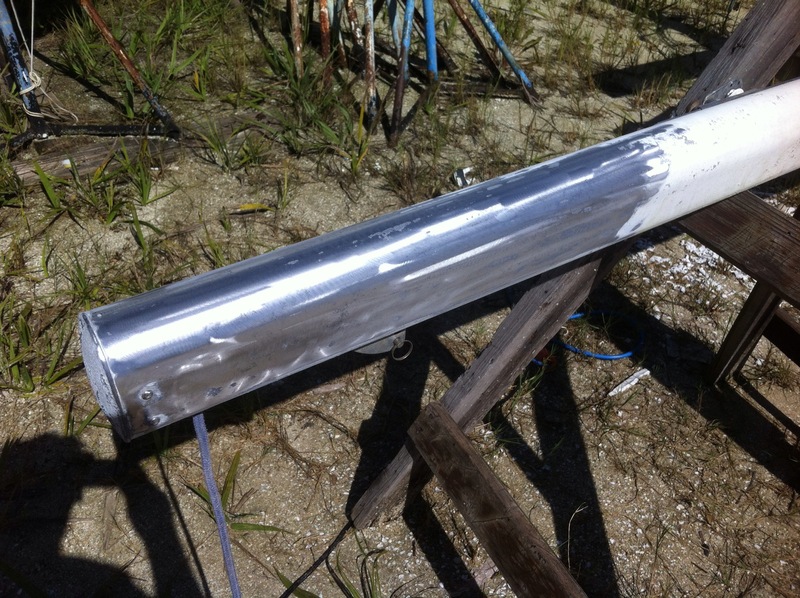 My task for the rest of this week is to figure out how to attach our AIS antenna, signal flag halyard and deck light to the spreaders with a minimal amount of drilling. I have some ideas of what may work, we shall see. Manatees fighting over fresh water. 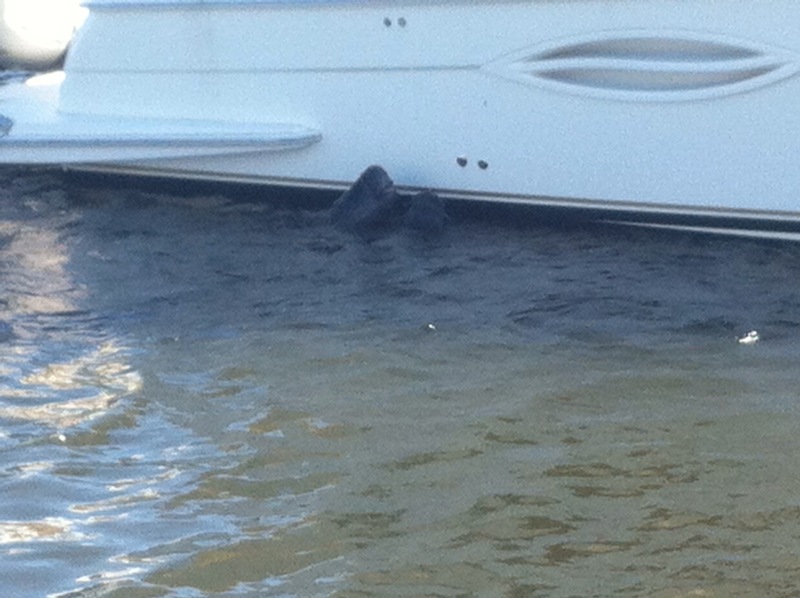 Our neighbor was washing his boat and a good six manatees were jockeying for position under the scuppers to get a drink. Numbers – Radio and AIS information that need to be done. Today I was looking at AIS class B transceivers to go with our VHF DCS radio. In reading about features and such on our VHF and and AIS we will need to program both with an MMSI number. What is an MMSI number? Well it is a nine-digit number “Maritime Mobile Service Identity ” that when you use a digital radio or such identifies your boat in a Data base. If you are not leaving the United States an MMSI number can be had for free at Towboat US. They put it in a stateside database that the Coast Guard uses. However this database does not work overseas in places like, well the Bahamas for example. 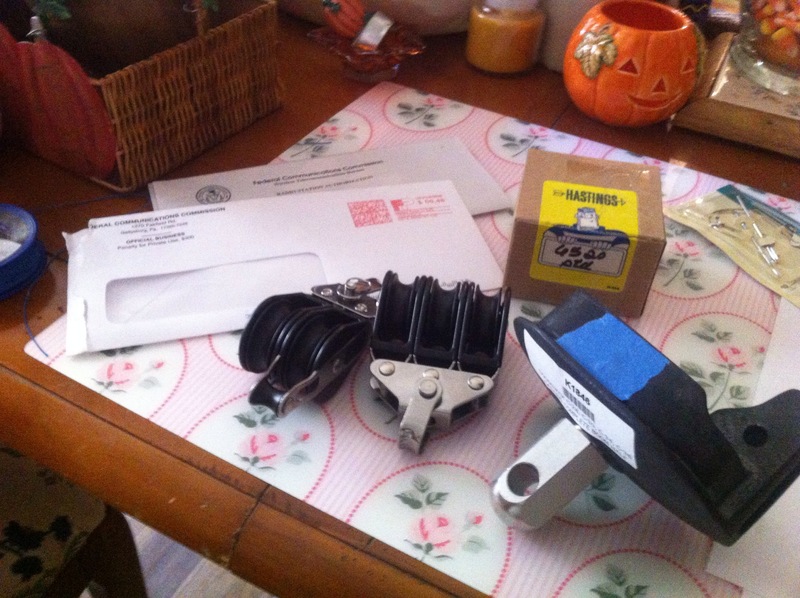 For that you need to sign up with the FCC and actually get a number licensed to your boat. Uggggg. First you will need a FRN number and login, you get this by entering yourself in the FCC database. After you get your FRN you apply with an form 605 available here. It states you may also have to do a 159,160 or 1070y, I did not have to myself, even though I spent a few hours fighting with these forms (going in numeric order) until giving up and doing the 605. It allowed me to pay the fee online and they sent me a receipt. When filling out the 605 you enter emergency contacts and some basic ships data that will go into the Coast Guard database. Cost from FCC $215. Good for 10 years. 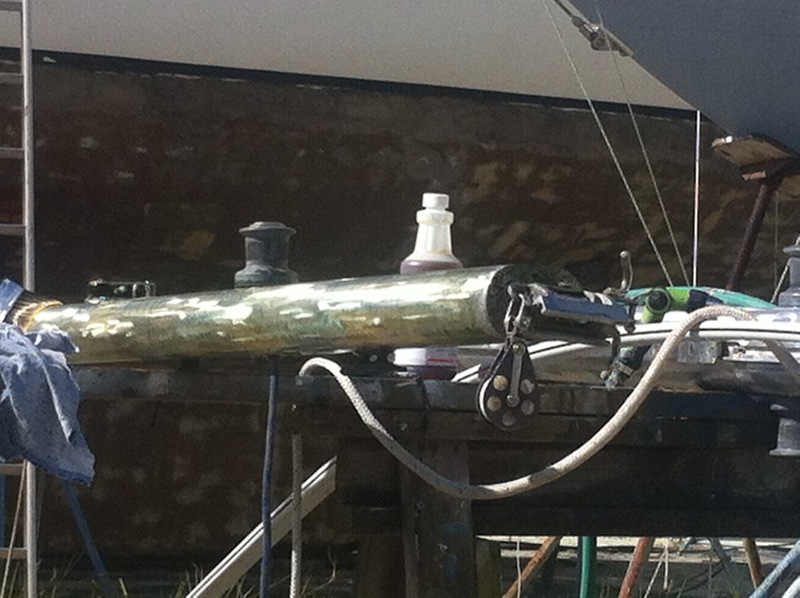 Last week we removed our boom end castings and the mast step to be media blasted and powder coated. 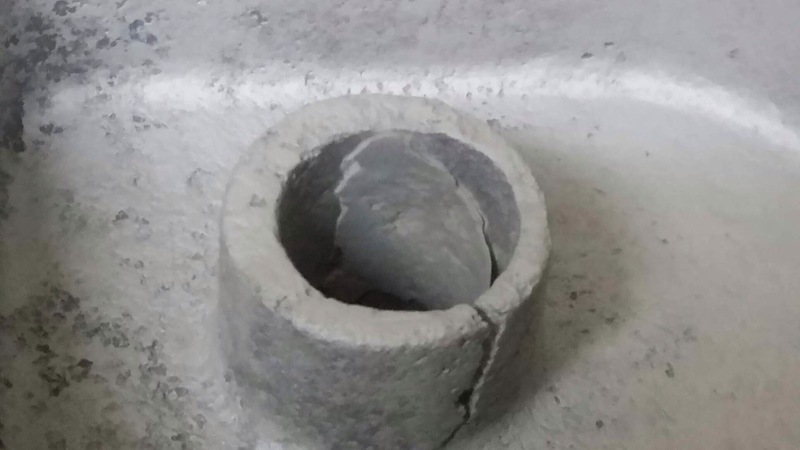 Heard back from the fellow doing the work and it seems our goose neck end casting is shot. 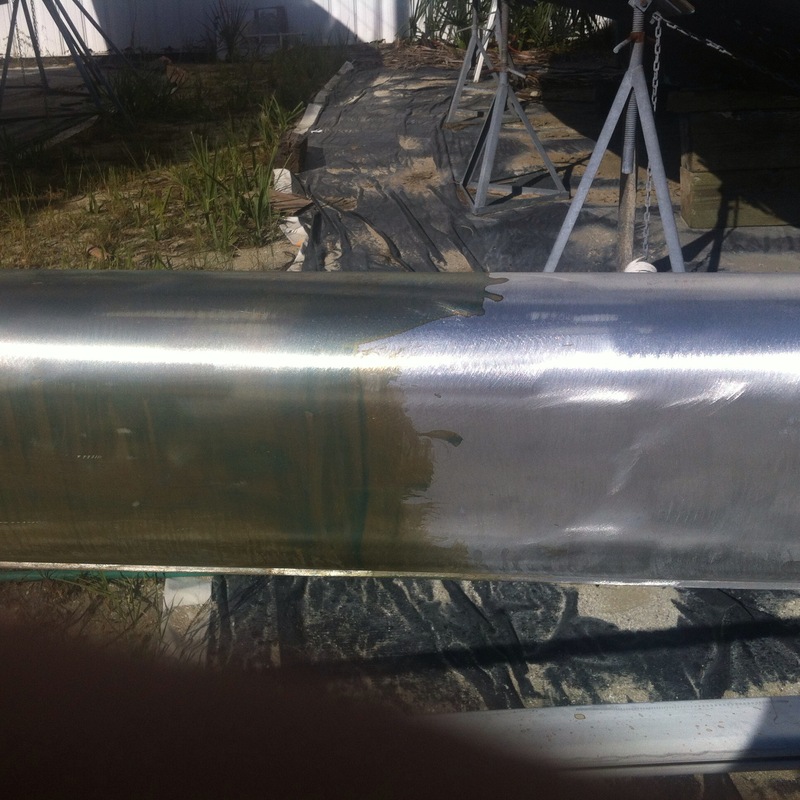 Before picture with the casting installed in mast. This is the type of thing that can only be found by disassembling. 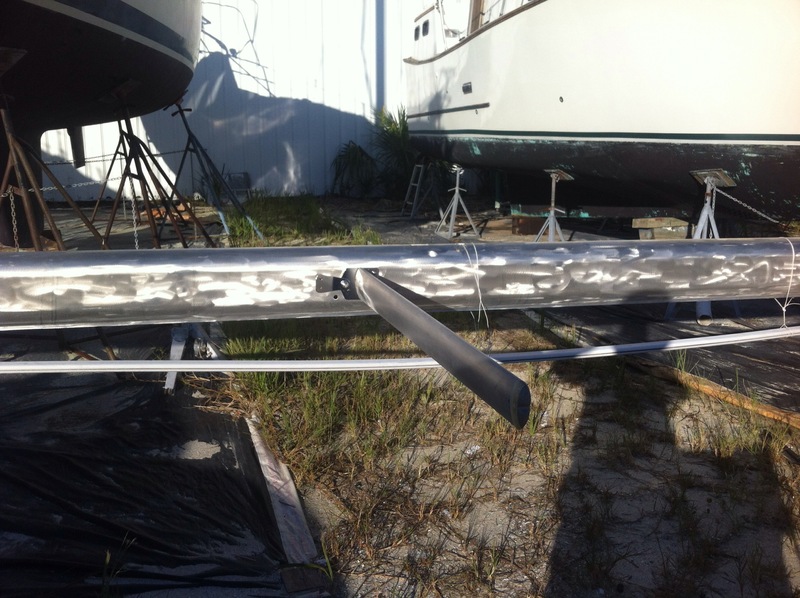 Lori and I got lucky we in deciding to get the ends made pretty again as we could have skipped the step and someday we could be running downwind and Gybe just to have the casting fracture under load. Not good. We have a call in to Catalina Yachts for a new casting. 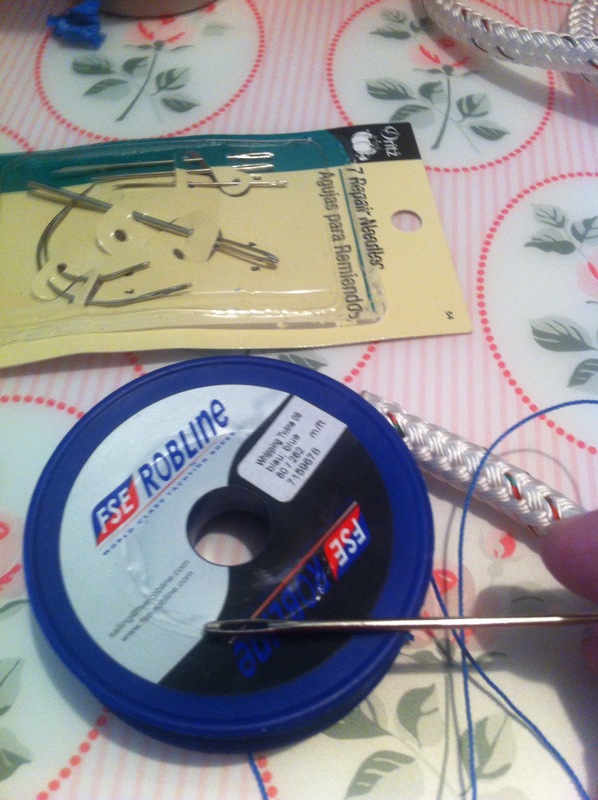 If they can not supply one I have found one from Catalina Direct we can use but it requires a bit of cutting to make fit. Hopefully Catalina comes through for us. 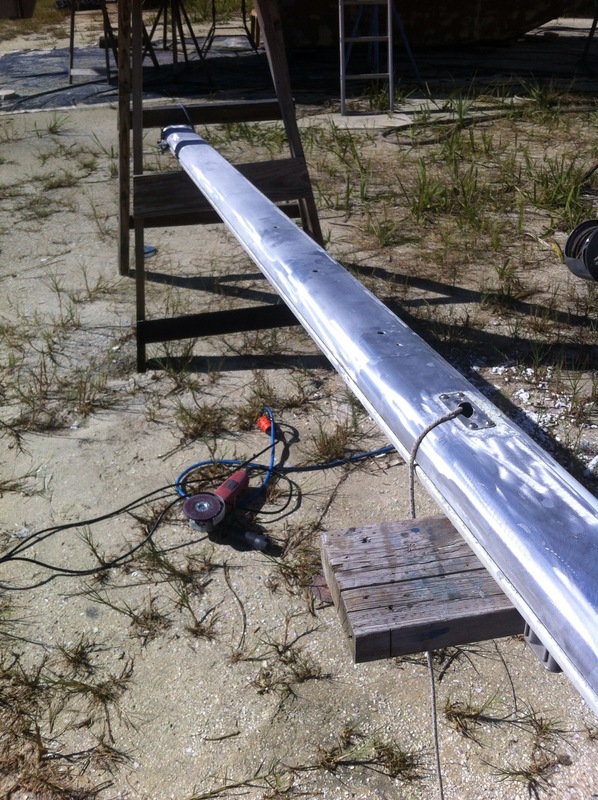 Also blasted was the mast step. We decided not to attach our shackles to our halyards with spliced eyes. 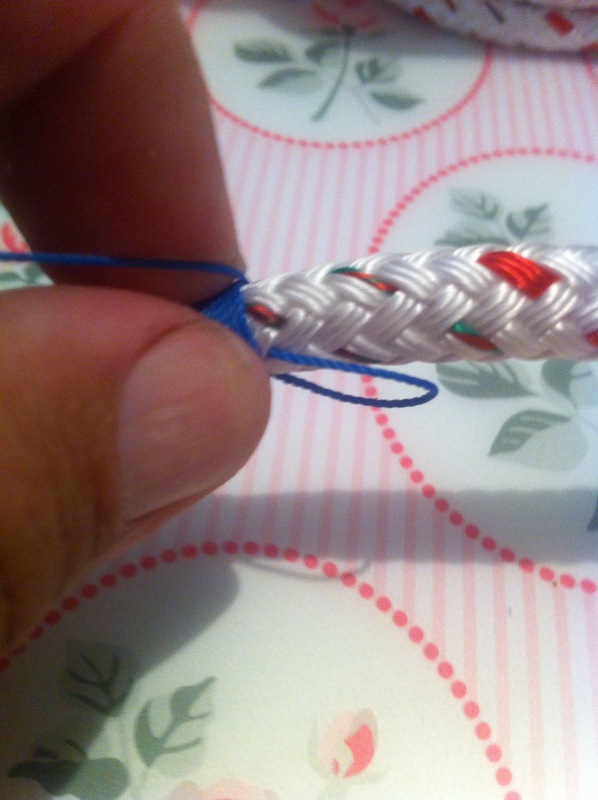 Opting instead for the flexibility of knots. 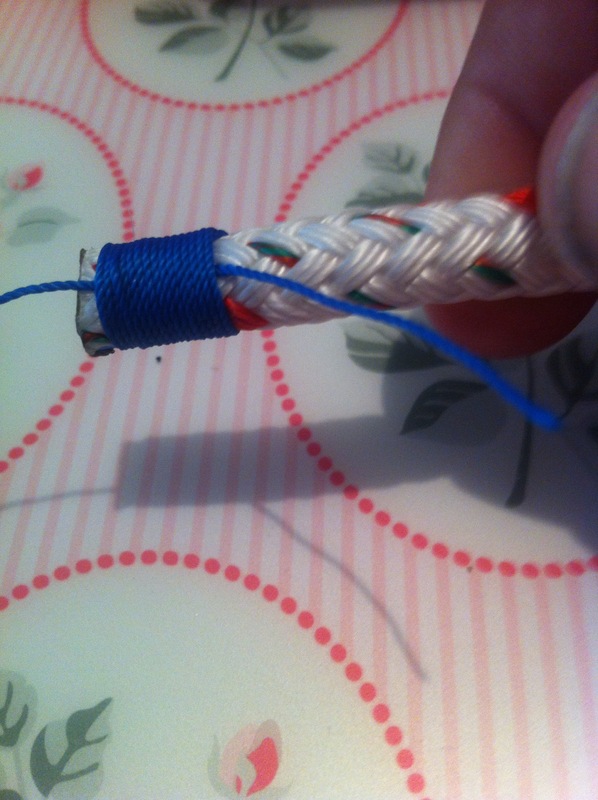 So I finished whipping the ends of the running rigging we have on hand. 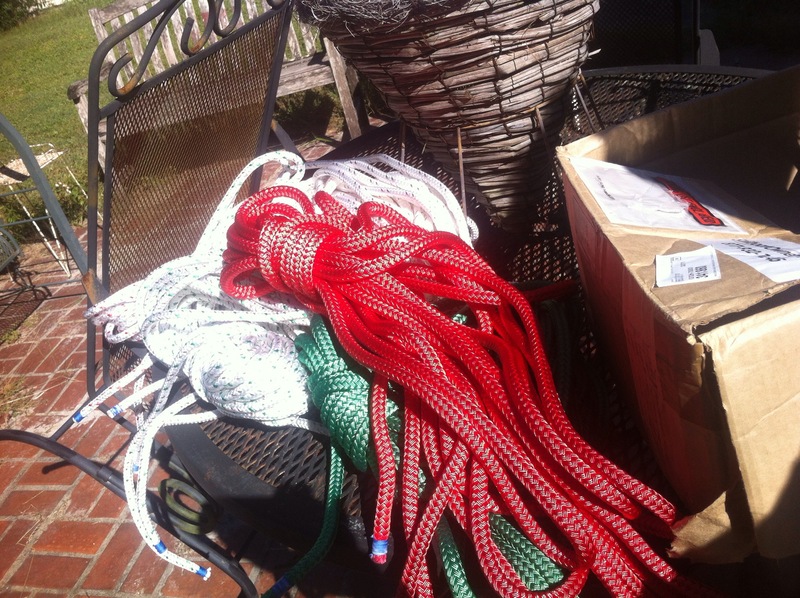 We do have two more halyards coming as we have the sheaves for 4 at the masthead and a mid mast sheave for a storm sail. 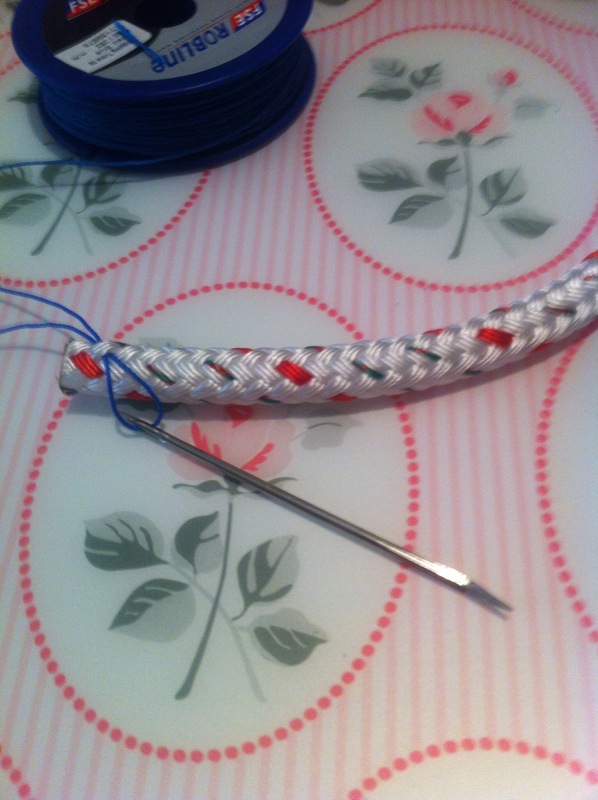 Finished but to trim the loose ends. 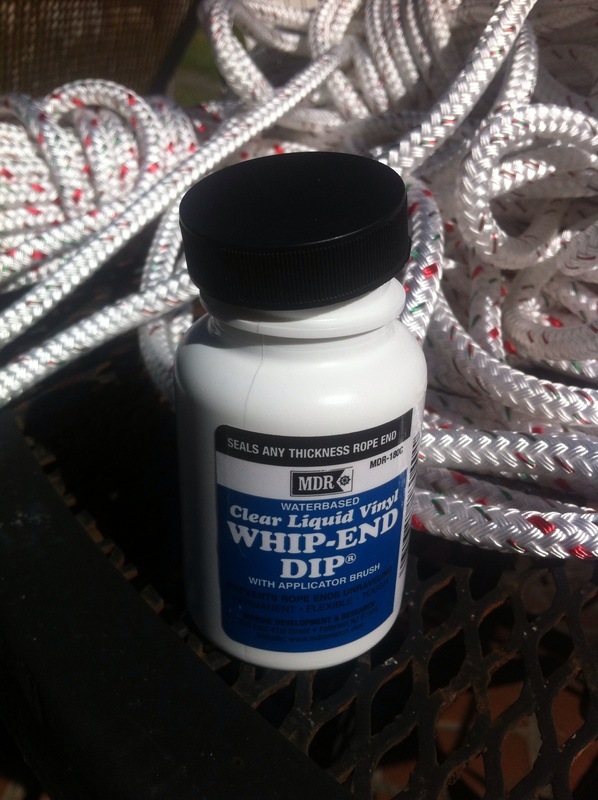 We also purchased some end dip in case we did not like the results of the old school whipping. I prefer whipping but since we had the dip we opted to coat the whipped ends just for good measure. Running rigging whipped, dipped and ready. I think this guy is waiting for Abby to come out and play. He let me within 10 feet or so. Now we are getting someplace. Outhauls, blocks, tillers, spars. We received new stripper disks in the mail. Wow, these things work great. 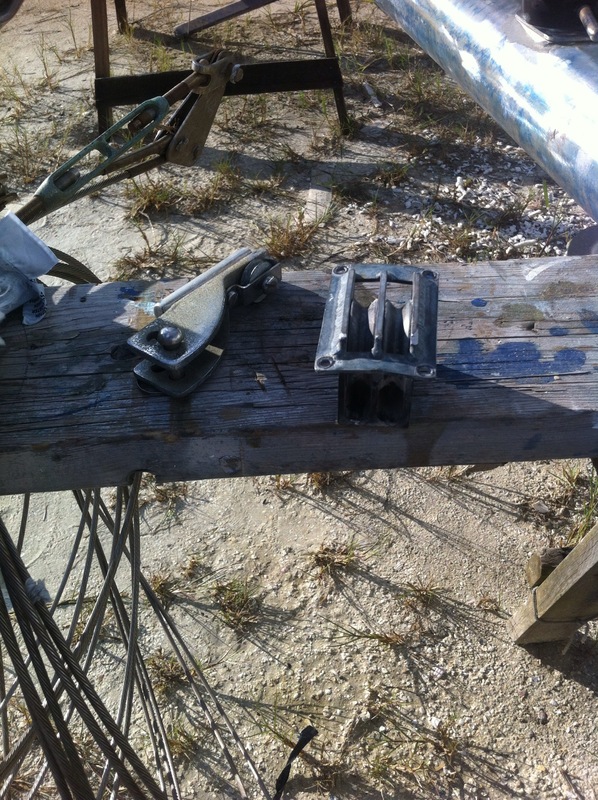 I was able to strip the boom and finish stripping the mast with just 3 of the 5 I ordered. 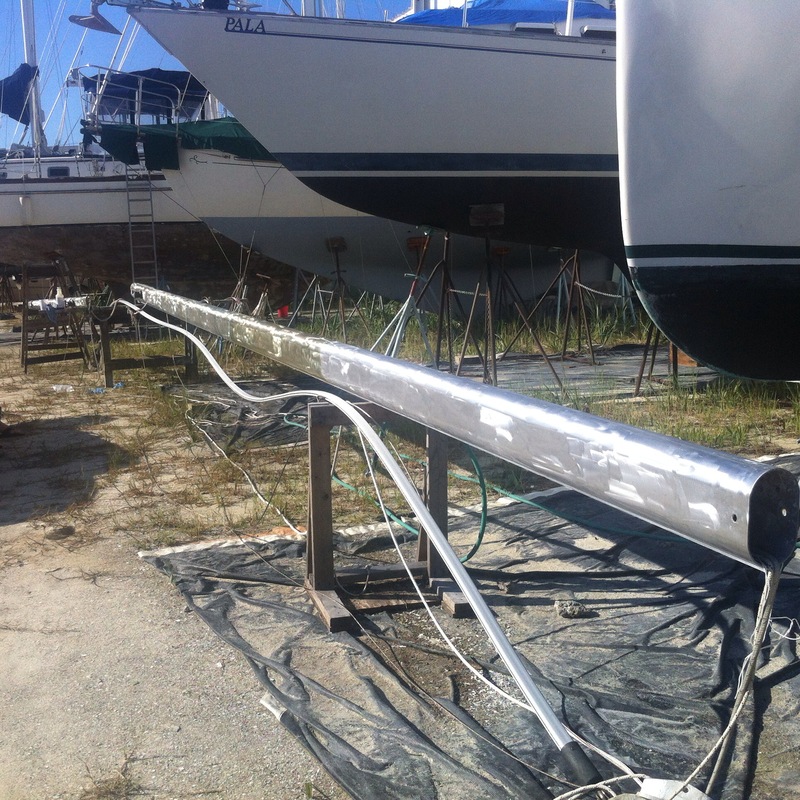 If we had not chemically stripped half the mast 5 or 6 would have done the entire project. As they say in the reviews, let the grinder and gravity do the work. The entire process reminded me of running an orbital buffer back as a junior enlisted in the Navy. Stripping away the old paint. Grinder works well. 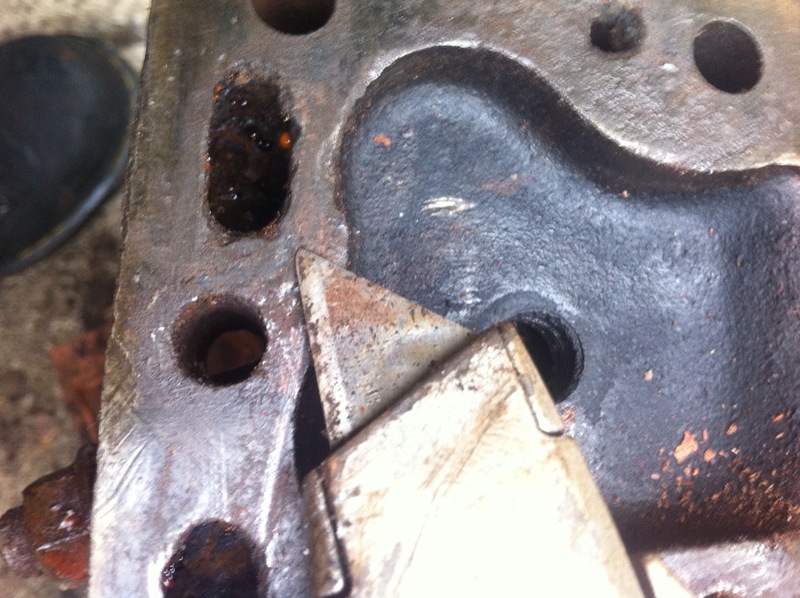 After stripping and polishing up the chemically stripped side we started to apply the Alodine. 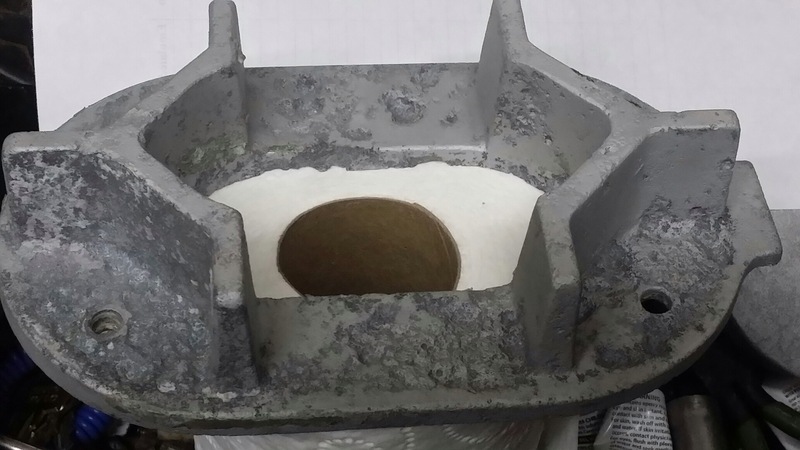 Left is after alodine, right is raw aluminum, before treatment. 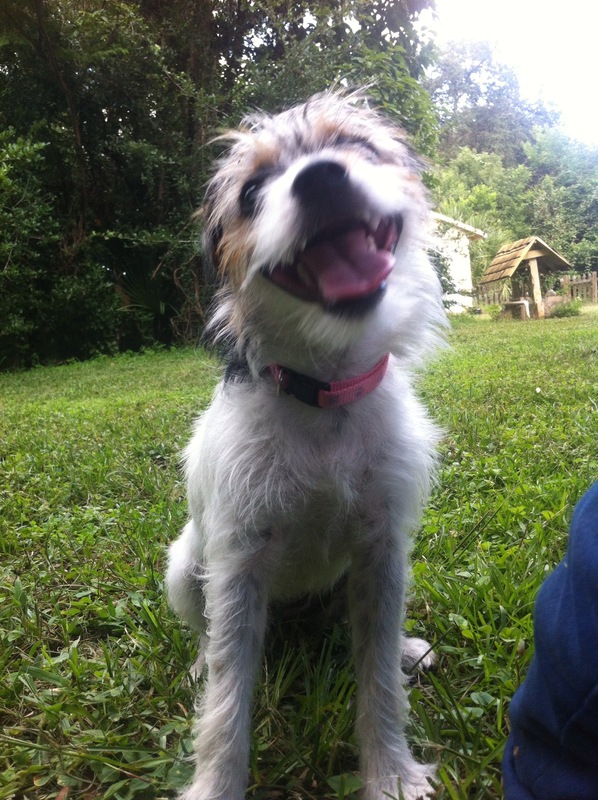 Half way thru treating with Alodine. The alodine as I understand it is ChromicAcid and possibly Iodine. It smells of Iodine. 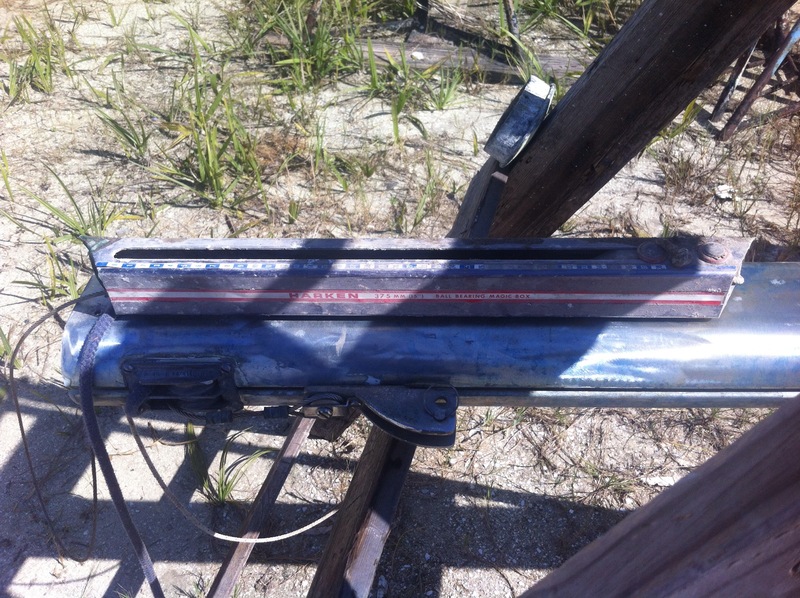 It leaves a things looking browned and with blue rainbow swirls. A rather interesting one of a kind look. Working on the boom we discovered the outhaul is not functioning, it seems jammed up. Sheaves, outhaul car from the boom. I removed the end caps from the boom, those as well as the the mast step are going to be powder coated. Mast step removed. 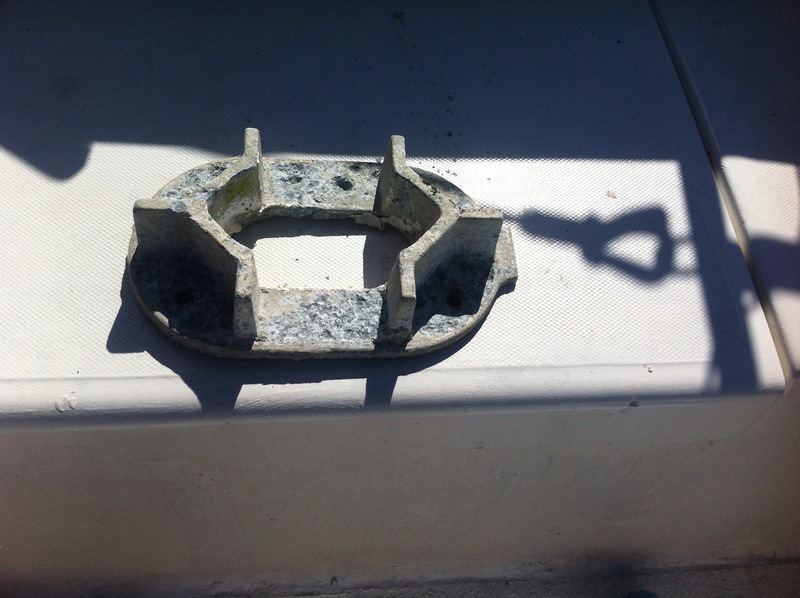 This is the part on deck the mast sits on. Held down to the deck by 4 bolts. It fits inside the base of the mast and is normally not visible. Once the end caps were off the boom I had to remove the old outhaul setup. It had been bolted in at mid boom and I had to use a big screwdriver and hammer to sheer off the last 2 bolts that had not rotted off. Harken magic outhaul. Seized up for some reason. 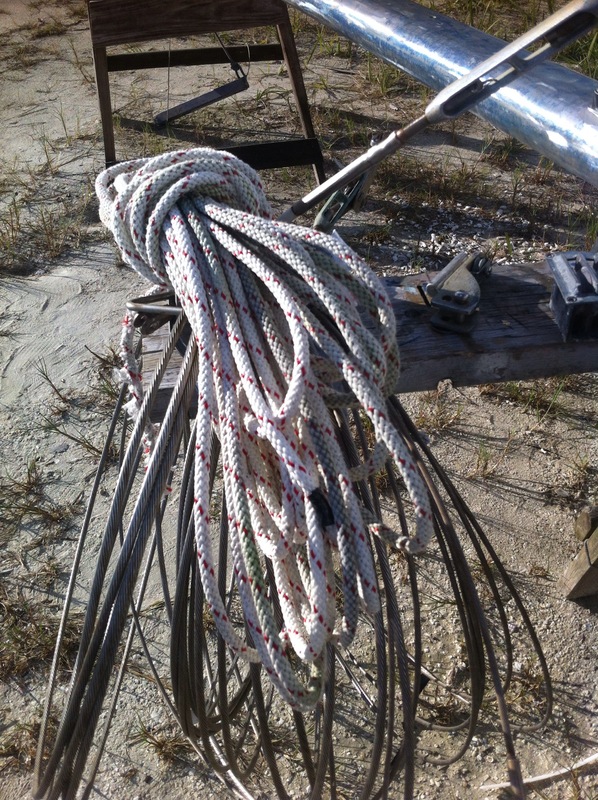 I have ordered 2 new blocks and plan on reusing the old jib halyard to build a new 6 to 1 internal outhaul. Old jib halyard sitting on the old standing rigging which is going to the shop. Whats that? A new tiller is what it is. Also in addition to putting on our new tiller our new Mainsail is done and ready to be picked up. We have our old standing rigging in the Escape and will be giving that to Mr Morgan to make us new. The engine block and head are at machine shop getting cleaned and sleeved. Abby approves of the work. It’s lunch an I want to organize my brain. Here goes with yet another To Do list. Controls, gauges, wiring harness, fresh water cooling, fuel tank sorting, alignment with the shaft. Bring standing to Mr Morgan for fabrication of all new stuff, finish stripping and alodine treatment, new running rigging install. Rewire of mast. Drilling deck plate. 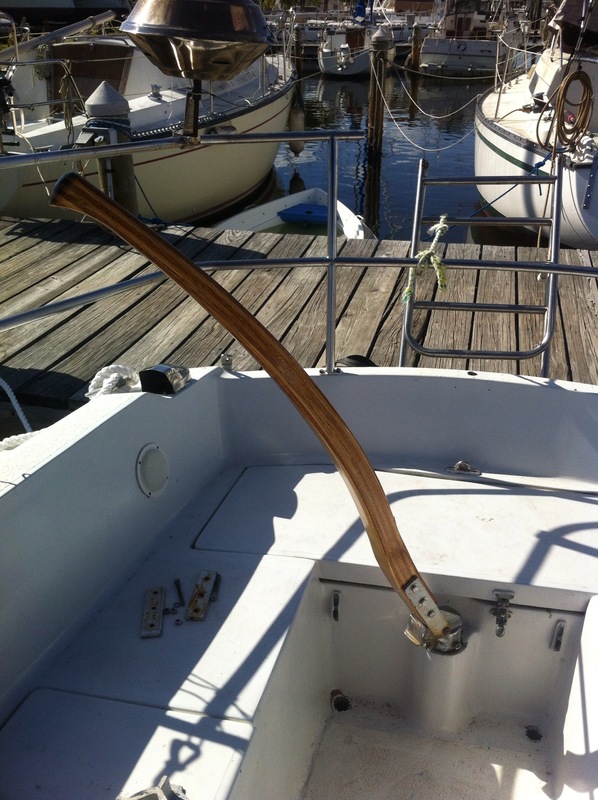 Fix bow pulpit break, replace bent stanchion, install bow roller and Mantis anchor, remove old head vent and seal hole, rebed fresh water deck fitting as they leak, weather board for companionway. Install tiller. Install AIS,VHF and chart plotter and network all together. Install new 12v outlets port side. Install 2 more light fixtures, one for galley and one for Nav station, Finish running light upgrade install. Buy and install auto pilot and network it. More spar work done last weekend. 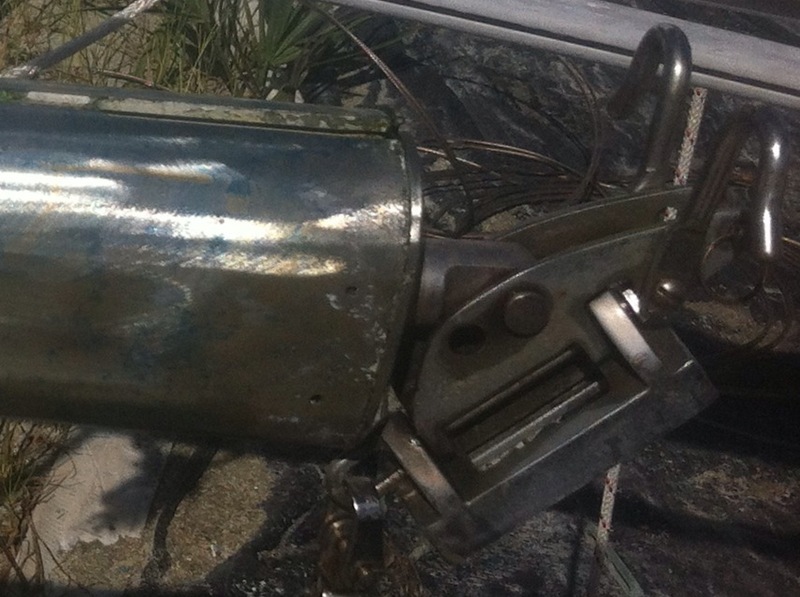 Angle grinder on boom, a photo study. After stripping half of the mast last weekend we opted to try angle grinder stripper disks as we did not care for the results of the stripper. We were gave these disks a try. The first issue we had is this type of disk requires an adapter be purchased for the grinder. $12 for the adapter and $12 for 3 disks. Unfortunately they wore thru too quickly. 6 Disks ( 2 packs) got us about 60% of the boom done. They wore out quick and started to wear down the adapter. We ordered some Norton stripper disks for the grinder, hopefully we get everything stripped and polished next weekend and can treat both spars with Alodine. 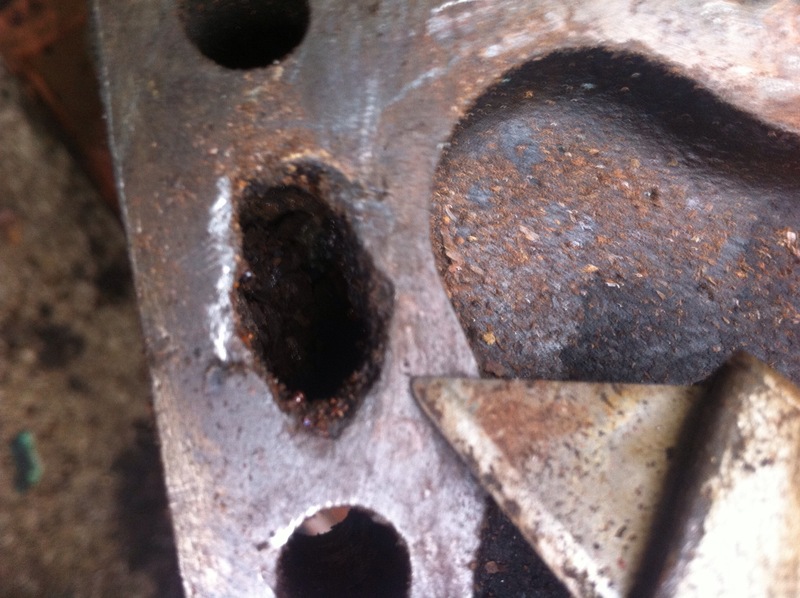 We are pretty much done stripping down the motor. 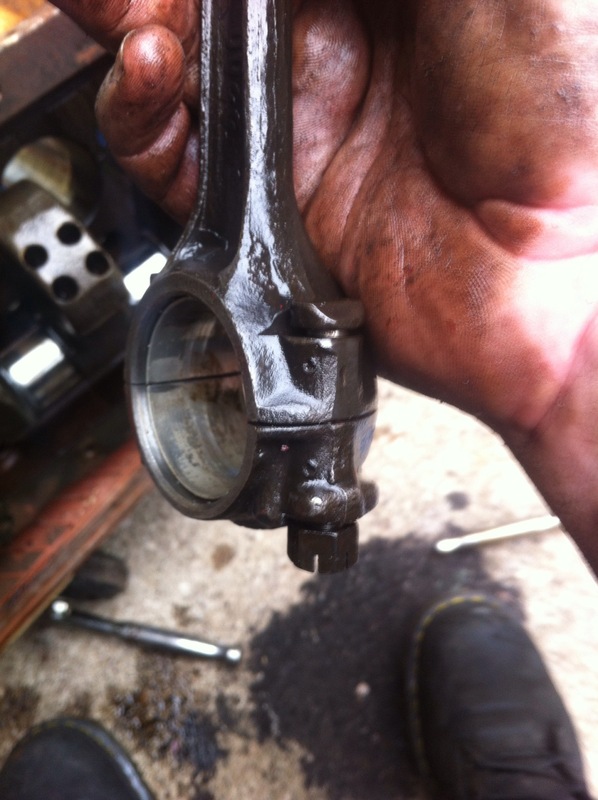 This afternoon I removed the pistons,crank shaft and cam shaft. Interesting in that all the rods are marked with the cylinder number (1 thru 4) Makes it easy to keep them in order. 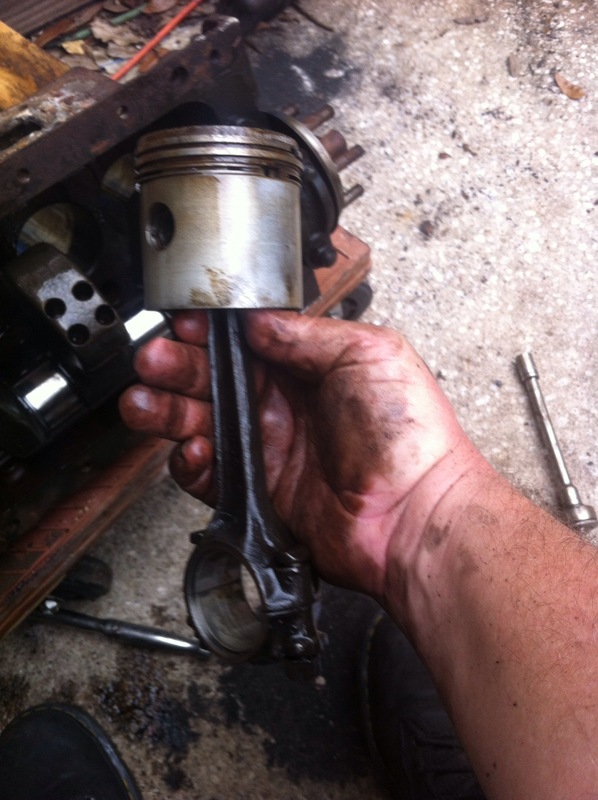 Piston and rod in my dirty hand. 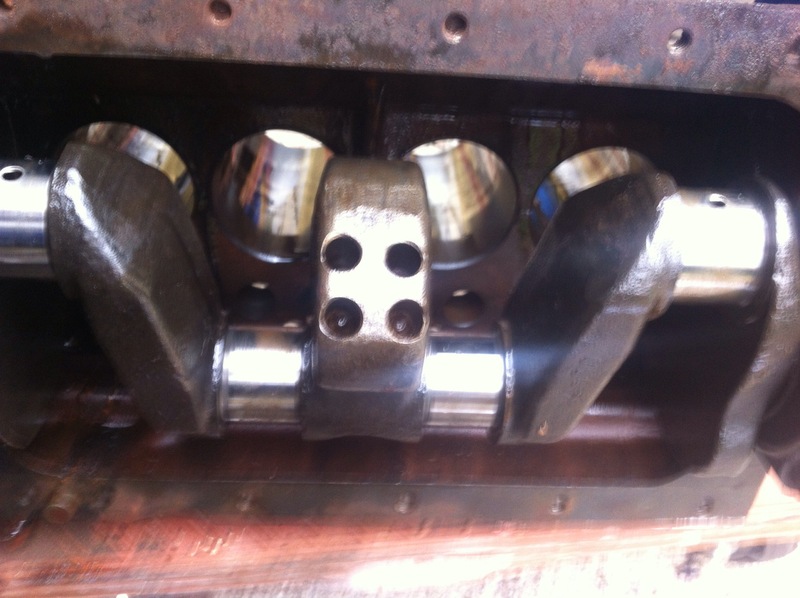 All that is left is to drift out the bearing surfaces for the camshaft (hope to reuse) and remove the bolt and screw on the oil galleys. A few minutes work hopefully. Next will be taking the block and head to the machine shop for a hot dip and have the motor resleeved. Looking at our early model head I came across something that worried me. I worry that the jacket is too far gone to be worth using. My new style head has no such erosion. I was hoping to go with the old style and forgo a thermostat but may have no choice in the matter.